The idyllic farm conjures up images of chickens scratching around the farmyard, cows grazing in green pastures, and gardens producing a bountiful harvest. One third of our food supply is achieved through the endless effort of pollinators, in particular bees. The economic value of insect-pollinated crops in the United States is estimated to be $20 billion dollars in 2000, with native insects responsible for a least $3 billion dollars in crops. 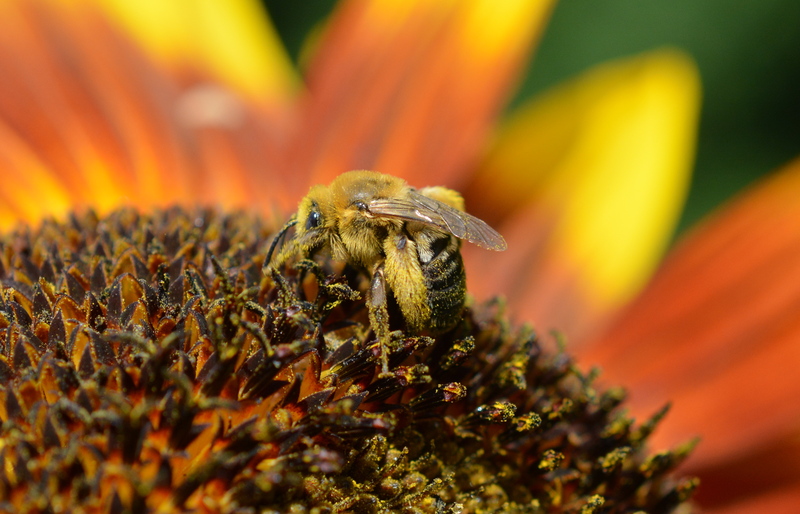 Honeybees are credited with the majority of the work, but the best and most effective pollinators are our native pollen bees and other native pollinators. There are nearly 4,000 native bees in North America with over 400 native bees found in New York. This is a snap shot of a typical garden found in the Hudson Valley and the small floral visitors busy at work gathering pollen and drinking nectar. The blue orchard bees (Osmia spp. 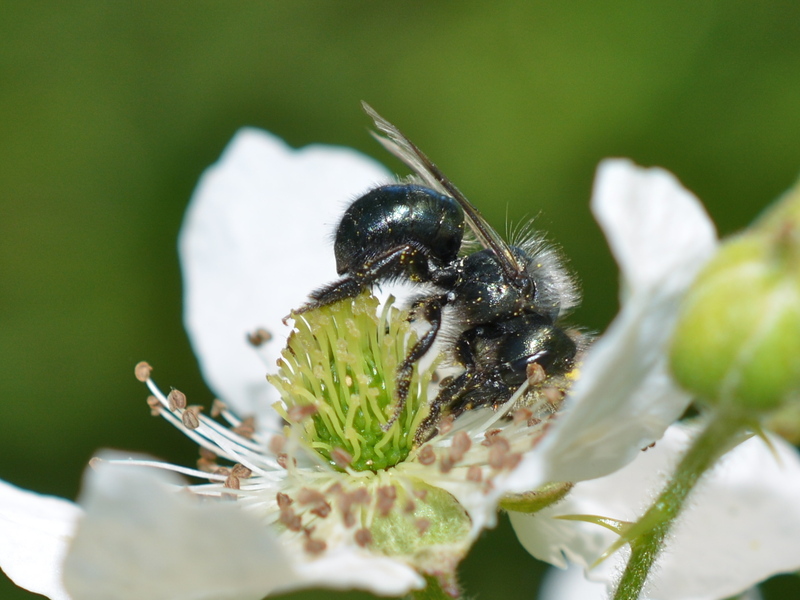 ), a type of mason bee, emergence coincides with the early blossoms of the rose family; blackberries, raspberries, strawberries, wild wine berries and apple and pear trees. A sharp eye is needed to see this quick fast moving bee that out performs the slower honey bee. Two hundred and fifty of these mason bees can do the equivalent work of two hives of honeybees. The female bee provisions each egg with “bee bread”, a pollen and nectar mixture, that she lays inside of tunnels and holes in dead trees. Bee houses create ideal habitat for this species that is active only in the spring. Her life’s work is complete once she has secured all her eggs behind mud walls. By mid-summer, different varieties of bees will populate the garden. The ever familiar fuzzy bumblebee (Bombus spp.) is present all flower season long; the queen in the spring and her workers by early summer will be busy pollinating a variety of garden blossoms. 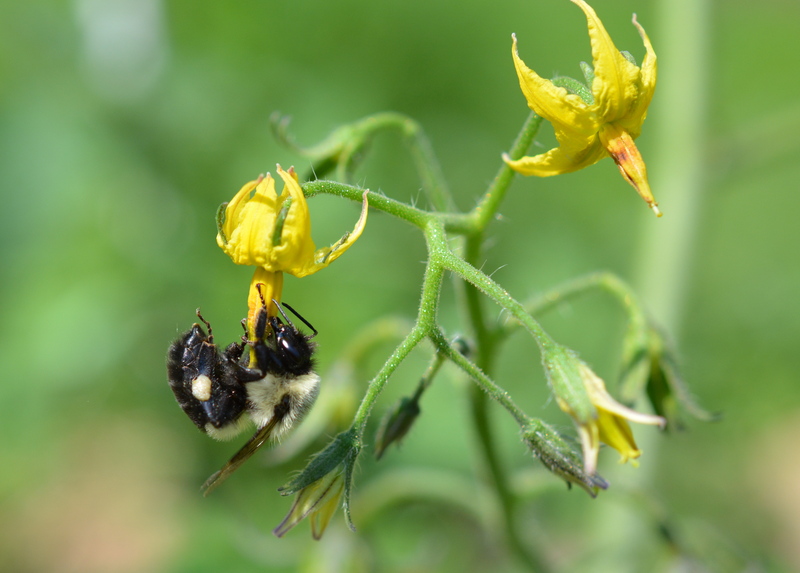 Numerous species may frequent your garden alongside the common eastern bumblebee (Bombus impatiens). Bumblebees (Bombus spp.) 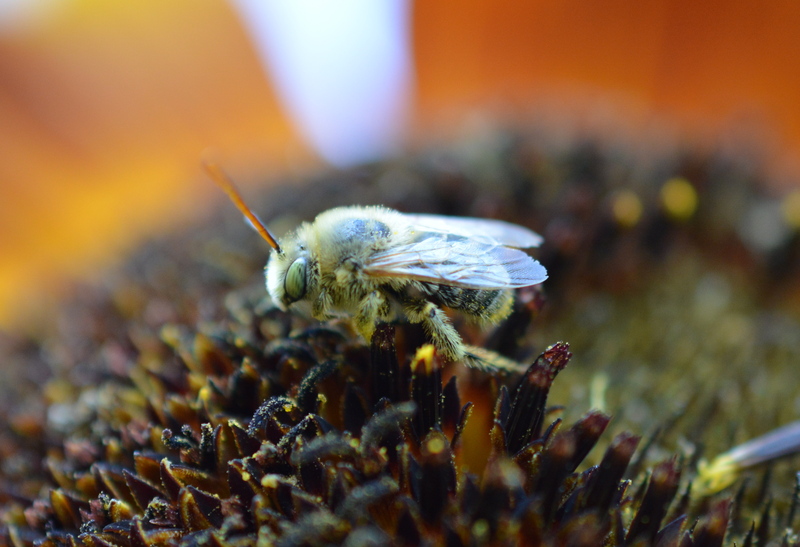 are generalists and visit most flower blossoms from the early spring apple blossoms (almost always a queen bee) to the late season sunflowers. On a quiet summer day sit in a garden and listen for a low humming buzz coming from a bumblebee upside down on a tomato blossom. The bee is shaking the pollen from the flower by fiercely vibrating her flight muscles. “Buzz pollination” is a technique developed by our native bees that have evolved alongside our native plants. Other plants that depend on “buzz pollination” include blueberries and cranberries. The large carpenter bee (Xlocopa spp.) looks similar to the bumblebee but has a shiny hairless abdomen. These are the largest bees you will encounter and perhaps one of the most docile despite the stingless male bees dive bombing tactics, an intimidation antic to scare unsuspecting passerby’s or other intruders. The carpenter bee is a solitary bee and unlike bees that use existing nesting cavities or dig nesting chambers underground, the female chews her own nesting hole in dry wood. This nesting cavity will be reused year after year by ensuing generations of carpenter bees. Carpenter bees often cheat pollination by using thier strong mandibles to tear open the side wall of the flower to steal the nectar. 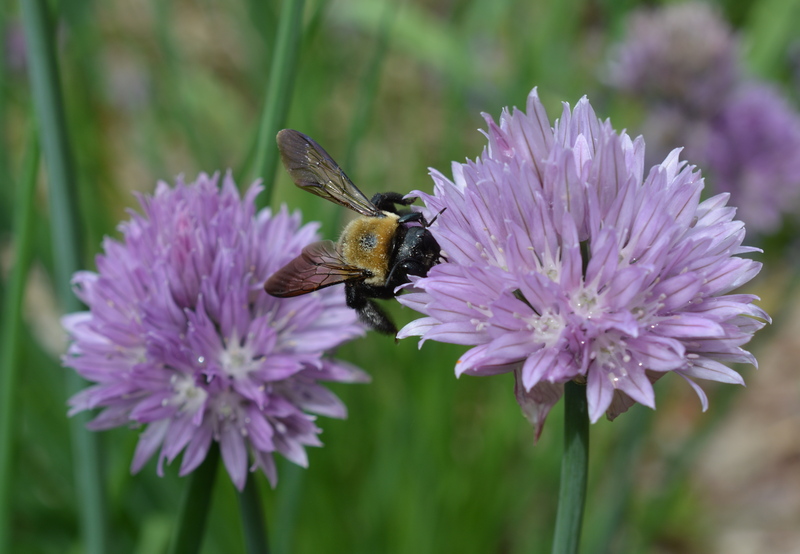 A Carpenter Bee Pollinating Chives. 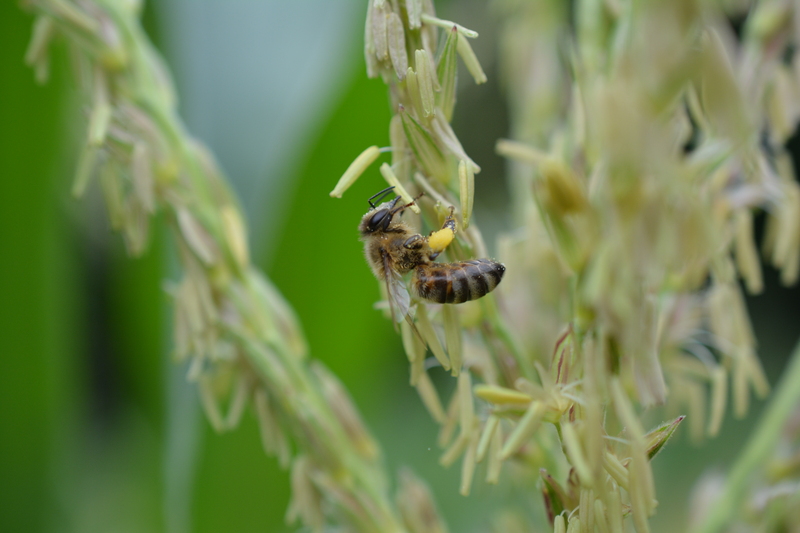 Corn is wind pollinated but it does attract quite a crowd of bees to tassels full of protein rich pollen. Honeybees (Apis mellifera) and bumblebees (Bombus spp.) can be found quickly gathering pollen they can use to feed thier developing brood. By mid-summer when the squash blooms a mid-sized bee with a striped abdomen is busy at work deep in the orange flowers. At first glance it might be mistaken for a honeybee (Apis mellifera) but in fact is a native squash bee (Peponapis spp.). These bees are specialists visiting flowers in the squash family: summer and winter squashes. The females are very active and climb to the top anther using it as a launching pad to take flight. The males tend to spend a bit more time in the blossoms drinking nectar with their long tongues. They even sleep in the flowers that close around them during the heat of the day. 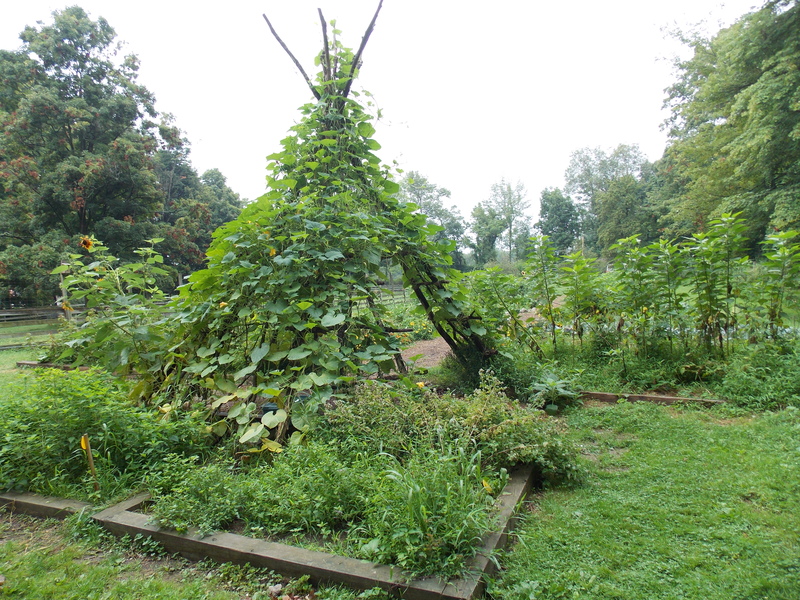 Squash bees are ground nesting bees and the female nests directly under the pumpkin plants or in a nearby location. These bees are always close to the flowers they feed on, and are up and active a half hour before sunrise just as the new day’s flowers open. 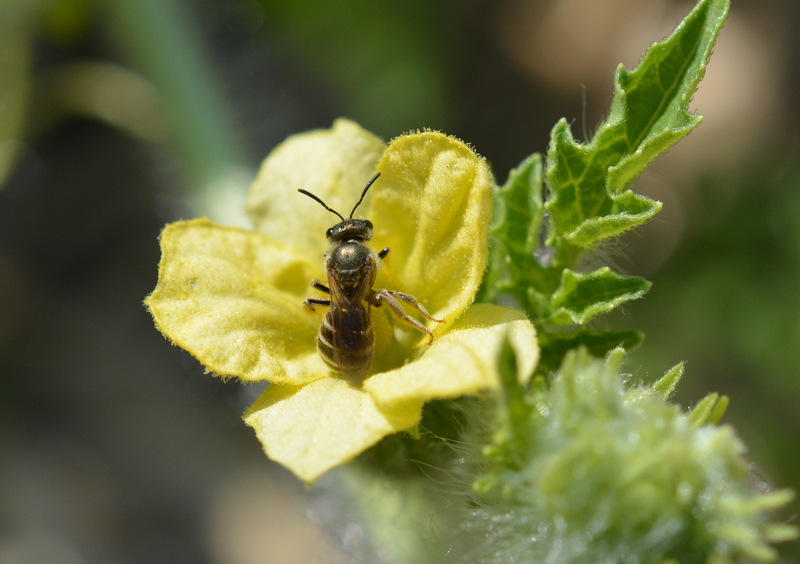 Other bees you will see at the squash include bumblebees, honeybees, green sweat bees and dark sweat bees. A sunflower is a composite flower composed of hundreds of tiny flowers that make a banquet feast to pollinators. Each little flower becomes a seed. Bumblebees are frequent visitors to sunflowers but keep a look out for a stocky and hairy mid-sized bee called a long-horned bee (Melissodes spp.). Why long horn? The males have very long antennae compared to the shorter antennae of the females. The males lounge around on the sunflower while the female is rapidly moving around collecting pollen on the shaggy scopae hairs that cover the lower half of her rear legs. When provided a pesticide free garden with a diversity of flowering plants our native bees can continue to effectively pollinate our garden plants. On large scale farms, these bees can take on the pollinator responsibilities in the absence of the honey bee or simply work alongside the honey bee. Pollinator friendly habitats adjacent to and interspersed among large monocultures can provide the necessary habitat to sustain a healthy and diverse bee population. As seen in this essay, some bees are active in the spring while others are active in the mid to late summer when their preferred flowers are in bloom. To sustain a diversity of bees it is equally important to provide a diversity of flowers to meet thier varying needs.